A rare transit of Venus occurred June 8, 2004, when Venus passed directly between the earth and the sun. Though it seems like that phenomenon should happen frequently, transits come in pairs that are eight years apart, followed alternately by spans of 121 ½ years and 105 ½ years. 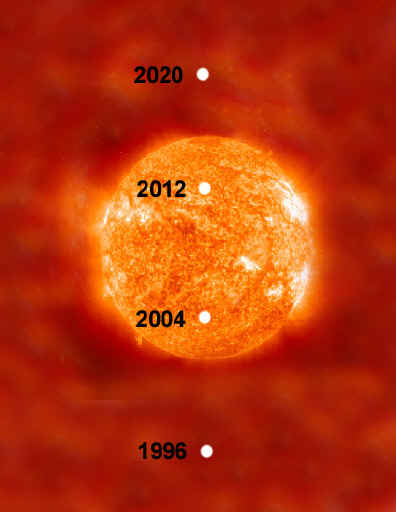 In the 21st century, the transit pair occurs June 8, 2004, and June 5-6, 2012. 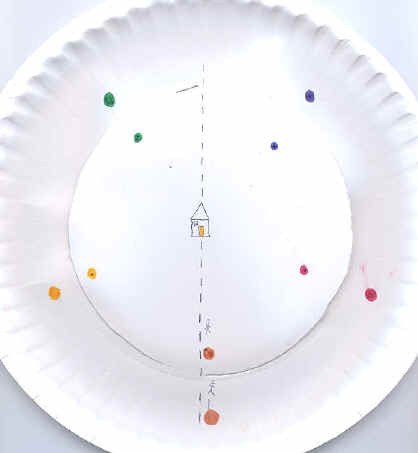 This activity offers a simplified explanation of that seemingly irregular period. Imagine that daughter Venus and her mother Earth are going to race around their house. The young daughter, faster of the two, will run close to the house, while Mom will encircle the whole yard further out. Mother Earth agrees to run eight laps or until daughter Venus overtakes her five times, whichever comes first. As seen from above, they run anti-clockwise (i.e., "planetwise"). They line up just slightly forward (to the right) of the yellow front door to start the race. This alignment is called an inferior conjunction--Venus is between the sunny door and earth. After running only 1.6 laps (around the house once and just past the back of the house a second time), mother Earth sees daughter Venus overtake her. At that moment, Mom has completed 1.6 laps while daughter has completed 2.6 laps. Mom notes her and daughter Venus' positions. The race continues. Each time mother Earth completes another 1.6 laps, daughter Venus catches up to and overtakes her on the inside track. Finally, after mother Earth has completed eight laps around the house, daughter Venus catches up to Mom for the fifth time. Conveniently, the finish line coincides with the original starting line by the yellow front door of the house. 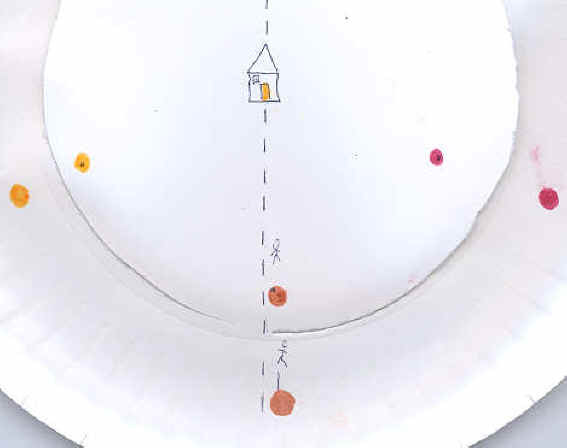 Mom's eight laps are shown on the outside of the plate at left. Five times (shown in five colors) she ran 1.6 trips around the house; five times daughter caught up and overtook her again. Daughter's corresponding position at those five meetings is shown in the same color. During mom's 8 laps, daughter sprinted 13 times around the house. For clarity, daughter's 13 laps are not shown. It would seem daughter Venus passes between mother Earth and the yellow front door (ignoring the intervening house) five times in eight years. Yet transits do not happen every 1.6 years, because two major factors interfere. First, daughter and mother are not running on a level surface. Second, instead of running a clean 8 thirteenths of mother Earth's speed, daughter completes one lap closer to 7.997 thirteenths of mother Earth's speed. 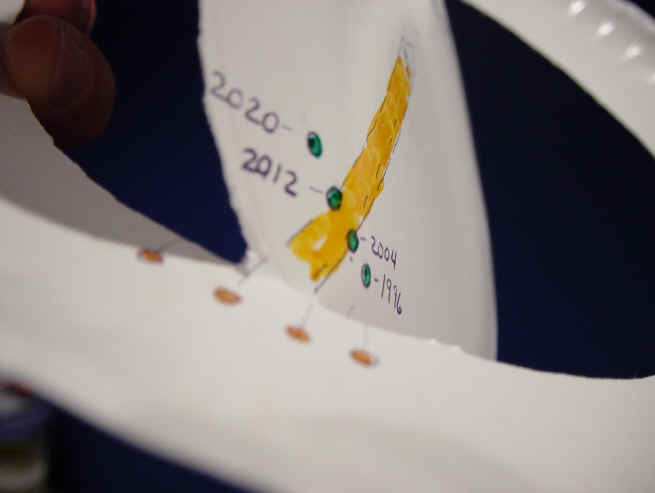 On the paper plate, cut two slits just outside the Venus markings to incline the planet's orbit. The "hinges" should align with the yellow front door, with the mother/daughter runners slightly to the right, as shown. Though the orbit of Venus is inclined 3.4 degrees to that of earth, we will exaggerate the angle for clarity. 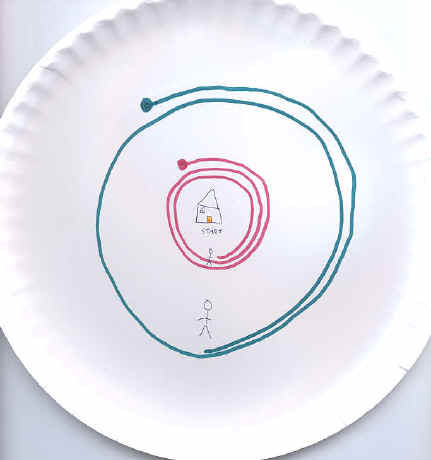 Push the right half of the paper plate down, below the earth's orbital plane, and the left half up, above the earth's orbital plane. 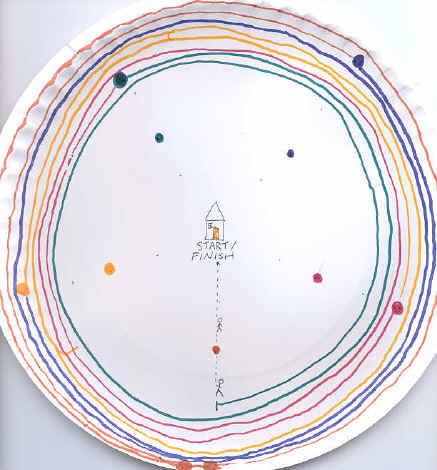 The runners in front of the starting line represent the 1996 positions of the earth and Venus. The hinges represent the two nodes, where the planes of the orbits of Venus and earth coincide. As Venus completes a first lap it approaches the descending node of its inclined path. Half way around its orbit, at the distant hinge, is its ascending node. Only when a conjunction is near a node can the planet transit the sun. 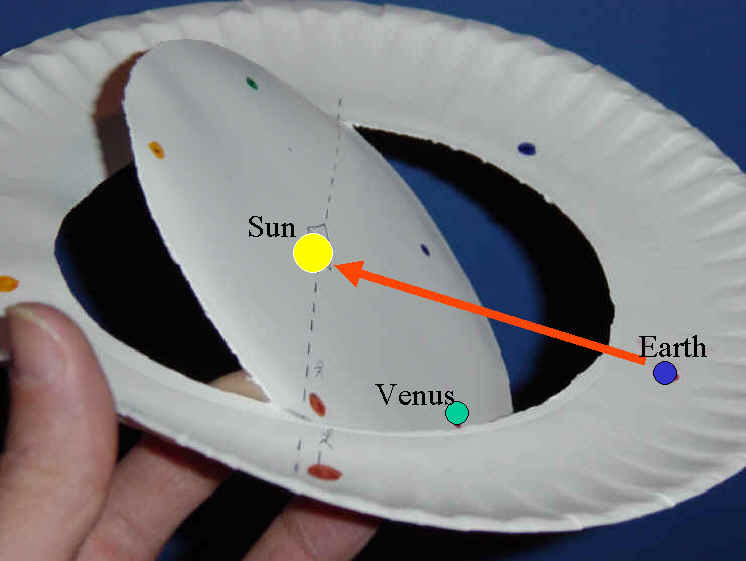 The rest of the time, when Venus is at inferior conjunction it is usually either above or below the plane of the earth's orbit. 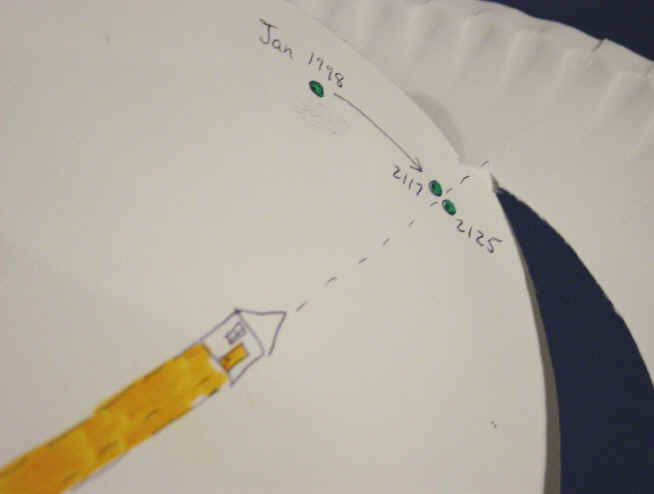 The 1996 positions of Venus and earth are represented by the running daughter and mother just forward of the starting line. Venus is just below the earth's plane. Recall how, instead of running a clean 8 thirteenths of mother Earth's speed, daughter completes one lap closer to 7.997 thirteenths of mother Earth's speed. With that tiny boost in speed, daughter Venus would have overtaken mother Earth and crossed the finish line just before mother Earth reached the front of the house. It also means that, if mother Earth were fit to run 8-lap splits endlessly, every fifth time daughter Venus overtakes her would be just a little bit earlier than the previous one. That is, each fifth meeting would be further short of the front door finish line. In each successive 8-year cycle, the conjunction is shifted slightly clockwise. In 1996, descending Venus just barely missed transiting the sun. For 2004 and 2012, Venus crosses in front of the sun's disk. In 2020, the planet is sufficiently far above the plane of the earth's orbit when it descends to the right of the sun and thus does not transit the sun. 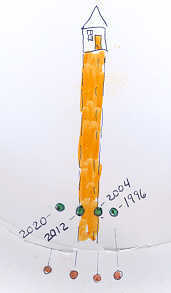 Similarly, not until the 1998 line of inferior conjunction regresses to the opposite node, after many eight year cycles, will the next pair of transits occur at Venus' ascending node in December, 2117 and 2125. Adapted from material by Peter Langford at http://dspace.dial.pipex.com/town/estate/vs76/trans.htm.